Functional drinks, both hot and cold. That’s something I have been tinkering with all my life! I started long before they – and all detox talk – became fashionable. My father Z’L, who knew every herb and plant and their many benefits, helped heal many booboos with some potion or other. You might say he gave me the functional drinks bug. Bad Cold? He poured boiling water over oregano, strained the infused mixture and added honey. Upset stomach (I remember we kids used to balk at this one but still drank it)? Seltzer with lemon juice, ground cumin and bicarbonate of soda, better know as baking soda. 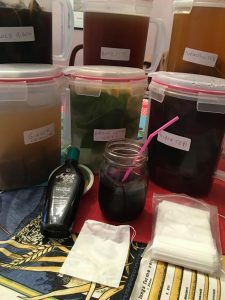 Every herb, every plant was turned into a drink, hot or cold, in the time it took for water to boil: Mint, basil, verveine, rosemary, sage, ginger, lavender, rose hips, hibiscus, fenugreek, turmeric, you name it, it landed in our cups. Good chip off the old block that I am, I keep up the making of functional drinks, and expand my collection constantly. I serve them to my guests all the time; not a peep about the total absence of soda, which I never buy and never serve. Making your own drinks richly rewards your little investment of patience and advance planning . They are well worth making at home at great savings. Once you have a few non-BPA pitchers, and strainers, you are on your way. I love the disposable tea bags as much as the reusable fabric bags, all inexpensive and all available online. Take a look at the reusable strainer, pictured, which reaches all the way to the bottom of the pitcher. This is where I love to make my cold brew. Just lift the strainer out of the pitcher, and you’re done: No hassle whatsoever. There is no limit to how many wonderful functional drinks you can make at home, in minutes and with pennies. Here are just a few examples: All my pitchers are 2 liters: a little over 2 quarts. – Cold Brew: Place the deep strainer with handle over a pitcher. Depending on how strong you like your coffee, add 1 to 2 cups of your favorite ground coffee (mine is Decaf Sumatra). Infuse overnight or even longer. Remove the strainer, and you got yourself a perfectly clear, strong and delicious pitcher of cold brew. Attention cold brew aficionados: No ice! No sugar! No milk! Neat: It’s that good! But of course it’s your cuppa joe, who will stop you if you cheat? Just don’t share your heretic preferences with the Cold Brew Hipsters, or you might get excommunicated! Seriously: I do love ice moccha. I simply add a little chocolate coconut milk. Say, one part milk and 2 parts cold brew. – Iced Tea: Put loose tea leaves in a large disposable drawstring tea bag, or simply use tea bags, place in a pitcher and pour boiling water over the tea. I use about 15 tea bags per 2 liter pitcher. Let the mixture steep overnight or longer. I rarely sweeten my cold drinks, but when I do, I only use stevia. Same as for cold brew above: No ice, so as not to dilute the contents. A drop of milk or dairy-free milk maybe. Special shoutout to my Sore Throat Remedy, which I call turmeric tea: My husband and I love it, in sick days and healthy days. – Licorice Tea: Including it in the hope licorice grows on you. Licorice drink, also called Antesite, and all things anise/licorice, are very underrated and under-appreciated in the US, and widely popular beyond. Here is one brand Antesite I order online. A container will make you more than 100 drinks, as it is so potent and so concentrated it has a built-in dropper; a few drops is all you need in a big glass. Zero calories and delicious, antesite comes in three flavors: Mint, anise and lemon. Antesite is naturally sweet, so no need to add anything. Add a few drops antesite to a tall glass of cold water or seltzer. Try it hot sometime. Wait till you see how many lemonade variations are listed. This includes the big Limonana star! Infusing, just like pickling and preserving, rewards patience and advance planning. We all know about immediate gratification. Now let’s try making it today, enjoying it tomorrow! Oh boy, the wonderful infused waters you could make, using absolutely any herb and fruit you like: I devoted a whole chapter to infused waters in my Whole Foods Cookbook. No more racking your brains what to do with leftover herb or other! The best part is: when you infused-water pitcher is almost empty, you can fill it up again with water, keeping your infusion ingredients right there. By adding in pouches of flavorful and protein-packed Levana Nourishments to these drinks, these recipes won’t just be functional, they’ll also be sustaining and healthful! Thank you for sharing. A great resource indeed for anyone who would like to wean their family off the packaged junk!